The freedom to be who you are as an athlete today, to publically declare that you’re gay is something that would never have been possible without the early professional gay athletes who were courageous enough to come out. This was a time when they could lose it all – jobs, family, friends. One of these is former NFL player Esera Tuaolo who, after retiring from football, came out in 2002 on HBO’s Real Sports. He was the third NFL player to do so, following in the footsteps of David Kopay in 1975 and Roy Simmons in 1992. A 300-pound defensive lineman of Samoan origin, Tuaolo not only played like a pro, he absolutely looked the part. It’s hard now to believe that he actually lived in fear of being outed for his nine seasons in the NFL and even contemplated suicide. In 2006 his book, “Alone in the Trenches: My Life as a Gay Man in the NFL” was released, recounting how he had to live a lie to fit into the macho world of professional football. Some of his former teammates admitted that had they known he was gay, they’d have tried to injure him so they wouldn’t be viewed as gay, too. Since his coming out Tuaolo has continued to be a constant advocate for the LGBT community, traveling across the country to speak about inclusion. He has worked with the NFL to combat homophobia in the league and he appeared on The Oprah Winfrey Show in 2004 to share his story. But he will also visit high schools, colleges, corporations, even local church groups to talk about homophobia and the dangers of bullying as a now proud, openly gay man. 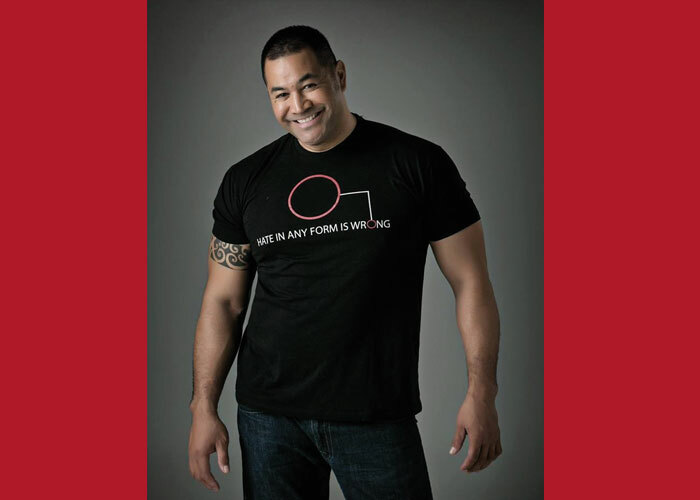 Born in Hawaii, Tuaolo was raised in an Assembly of God Pentecostal Church which looked at homosexuality as a sin or curse. Because of his strict religious upbringing, he particularly likes to address religious groups to share his personal experiences and to use his knowledge of the Bible to counter their homophobic views based on their narrow religious interpretation. Yet for all he’s faced, his message is still one of tolerance, acceptance and inclusion. He learned Hawaiian cooking from his mother and now has a catering business in the Minneapolis area. With a voice as big and powerful as his body, Tuaolo is also known as the “Singing Chef” because if requested, he will also sing at events he caters. But he’s really known for singing the National Anthem at various NFL games and at other events like the 2014 Compete Sports Diversity Awards where he was awarded Compete’s Legacy Award for his ongoing contributions to inclusion and acceptance. The devoted father of 16-year-old twins, Tuaolo’s goal in life is to educate people, to help create a world for his children where sexual orientation will never hinder them from reaching their full potential. No one can leave a better, more loving legacy than this.